It’s finally the end of another gardening season. I harvested my last kale on December 31, and now it’s time to take a break, and start dreaming about next year. In this episode I tie up a few loose ends to finish out the 2017 season for this podcast, I talk a little bit about things to come for the podcast and YouTube channel next year, and of course, I give a few tips on how to start planning for next years garden! » General Gardening, Podcast » 054 : Winter is here! 5 Responses to 054 : Winter is here! Love your podcast, this was another good one. So neat the way you saved Christmas with your wood stove. We have a wood furnace but that cannot cook food. Keep up the good work and inspiring ideas and thoughts. 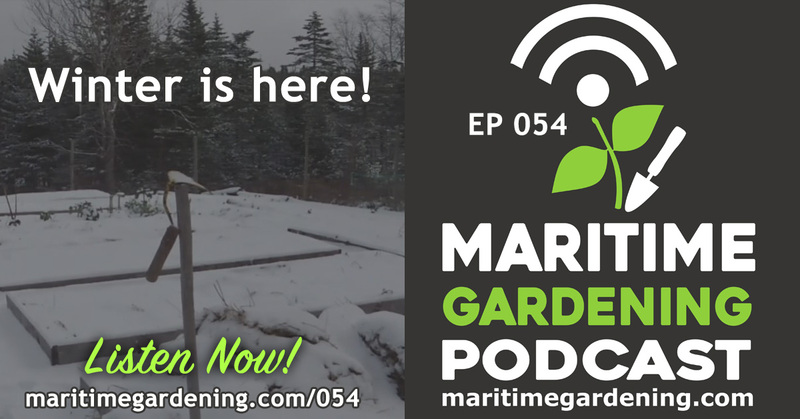 Nice to have a maritime garden I g podcast! Thanks. I really enjoy your youtube channel and this podcast. I look forward to your spring videos and podcasts. Thanks that’s so nice to hear!